This blog is about using a variety of learning techniques to better engage your staff. If you develop your own eLearning content, you might want to try these out. If you need help with boosting your digital content production, we'd be happy to help. Our clients are always asking us for creative learning ideas, so we are happy to share our expertise. How can unusual learning techniques help your staff? We can all spot stock images from a mile off. 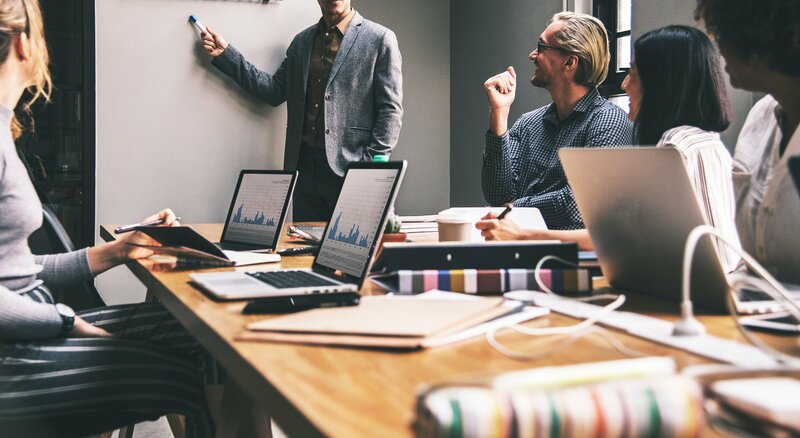 These pictures may be obtained without any hassle, but every eLearning content developer out there is using these photos to support their content, and repetition is, in plain words, boring. If it is possible, take your own photographs and include them in your content. If you are involved in an eLearning project, it can be as simple as taking photos of your staff. You could also use your office and customer settings for any scenarios and examples. Make sure that the photographs are relevant to the content, and add to the depth of understanding, instead of creating a contrast in concepts. However, if you use poorly angled or out of context photographs in your work, they will put your content on the negative spectrum instead of adding a positive character to it. Also make sure you give due credits and reference to the photographer if you are using someone else’s work in your content. natural, everyday people rather than stock imagery. Some people will feel that you have to be careful with humour as it often doesn't translate across cultures and different groups of people. While this is true, using techniques such as parody or extending a funny film/TV narrative to a learning situation can work well. This is because people will most likely be familiar to with the story and it can serve as a guidepost to help support the learning. For example, I once used Ricky Gervais's 'The Office' as a backdrop to writing a set of scripts to teach diversity awareness. The key message of the learning programme was that while 'banter' was a normal part of everyday office life, without awareness of the impact you have on others, it can go badly wrong. While none of us would ever admit to being a 'David Brent', sometimes, inadvertently we do act like him. Another example - our Sustainability eLearning course uses a 'cast of characters' who are based on workplace sterotypes. These characters help to get across common challenges in changing people's behaviour around energy efficiency. Even without considering learning, poetic words can invoke all sorts of thoughts and emotions. From Shelly to Sassoon to Wordsworth or Wade, poets throughout the ages have captured the hearts and minds of many people. Poetry can be useful as metaphors or just plain inspiration. Have a think about these poems; what type of learning programme could they help with? 'If' could be about many concepts, but topics like management and leadership spring to mind. 'The Road Not Taken' is a great analogy for decision making; encourage people to think through decisions and be sure you choose your path wisely. Consider what the path of least resistance actually means. An anchored drama is a story that evolves as you move through a learning programme. It contains a plot that supports the main learning themes that you need to get across. The story characters go on a similar journey to your target audience. You tell the story based on the many typical challenges and triumphs that your target audience could face. As an example - consider induction training. Normally, this is a fairly boring subject made up of policy documents and checklists that the new employee has to wade through. But what if you could tell a story about a typical 'First day' as a way of introducing a new employee to your organisation? Your character could meet many other typical workplace characters such as cynics and helpers and they have to choose the best sources of help to improve their first day. You could set tasks where your employee has to find information and make decisions on which questions to ask the best people. If the drama is constructed carefully, it will mirror the journey that most new employees should be supported through. We've published a case study on using anchored drama in a client project. No, we didn't make up this word. Taking something to the extreme is a great way of helping people to learn and remember. If you can guide your target audience towards saying 'I thought I was the only one who thought like that', then you are on to a winning strategy. Marketers are particularly good at this. Think of some of the most memorable advertisements you have seen. For example, a recent British Heart Foundation campaign to help teach CPR used a famous actor and a well-known song. 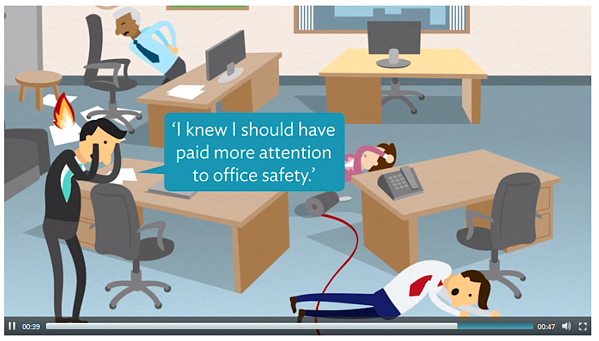 In our Office Health and Safety eLearning programme we created an opening scene called 'Office Carnage'. Taken to the extreme, ignoring office health and safety can be quite dangerous! The psychology of language is an underused tool in eLearning. While it is true eLearning content is more visual these days, we still use text to get key messages across. The words you choose and the sentence structure that underpin your words can have a big impact on helping your audience to be more motivated to learn. For example, speaking directly to your audience as 'you', rather than in the third-person brings the learning closer and makes reading easier. Also - take two simple words 'and' & 'but'. When you use the word 'but', it deletes what comes before it. We've all probably heard these words: "He's a nice guy, but...". The word 'and' on the other hand, tends to evoke more positive feelings. So you could say something like: "He's a nice guy and I think he'd be even more successful if..."
Phrasing language in the positive is generally easier for people to understand. This is particularly important when it comes to instructions or requests for people to do things. For example, which of the following instructions are you more likely to remember or adhere to? Why? Don't forget to turn out the light. Thank you. Thanks for turning out the light when you leave. What we actually hear and remember from the first instruction when we say it, is "forget to turn out the light" - we aren't very good at translating negatives. This learning technique probably deserves an entire blog post, but let's summarise the concept for now. A hinge question is an important question that is designed to get your target audience thinking. It usually focusses on a key concept - like a common myth, challenge or pain point. Everything in the question is geared towards learning; the question itself, the correct answer and the alternative choices. Even the feedback should re-inforce the key concept. Hinge questions, as the name suggests are important learning millstones - without understanding the concept behind these questions, then further learning can be impacted. The learning literally 'hinges' on answering these questions. A good learning programme will contain a few key hinge questions. Good scenario design is also based around key hinge questions. Hinge questions are unusual learning techniques for eLearning as they take time and effort to get right. "What is the difference between a leader and a manager?" This is a good opening discussion point to help see where your target audience is at. Some of the common myths could be - there is no real difference, or a leader is just a manager who gets paid more! What are your unusal learning techniques? We've love to hear from you if you have come across any of these techniques. We'd also be happy to give you a demo of one of our eLearning programmes showing these techniques. Check out our Content development services here.